Kinstones are stones which, once fused, generate happy events, like a chest or a secret passage appearing. There are 16 types of basic pieces, which are green, blue or red. You can own up to 8 different types, the other half being owned by Hyrule citizens. There are also special pieces which aren't shown on this page. To start collecting pieces, you have to talk to the travelling merchant in Hyrule Town to get a Kinstone Bag. The green pieces can also be dropped by enemies or found in bushes. 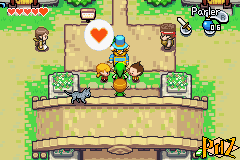 - In the Minish Woods, to go to the witch's from Lake Hylia, dash at the first pine tree (surrounded by darker grass)! - In the Western Wood, in the southeast corner of this area, wear your Pegasus Boots and dash at the lone tree there! Take note that several fusions can be performed with several characters, so this list isn't exhaustive. 32 Percy the Poet, in Trilby Highlands The wood pile gets removed from the west part of the Western Wood Percy goes back to his house only to find it already occupied! 71 Spookter, ghost of the Royal Valley's graveyard (2nd fusion) Makes his brother's mind about leaving Hyrule Town and frees a path You can now talk to (and perform a fusion with) the cuccoo ??? 76 Farore, inside her house or inside the Happy Hearth Inn of Hyrule Town (after going to the Royal Valley) Joy Butterfly in Castor Wilds Catch it to dig faster! 77 Din, inside her house or inside the Happy Hearth Inn of Hyrule Town (after going to the Royal Valley) Joy Butterfly in the Wind Ruins Catch it to shoot arrows faster! 78 Nayru, inside her house or inside the Happy Hearth Inn of Hyrule Town (after going to the Royal Valley) Joy Butterfly in the Royal Valley Catch it to swim faster! With the 9 mandatory Kinstone Fusions during the main quest, you reach a total of 100 possible fusions. 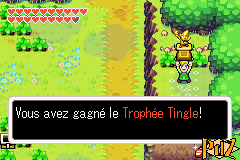 Go back to Tingle and talk to him several times for him to give you the Tingle Trophy!